Representing a new chapter in Bolon’s 70-year history, Innovators at Heart (Hall 16:B27) is packed with new products, crossover collections and collaborations with some of the most reputed international design brands. Bolon will present their latest architectural flooring collection designed by Pritzker Prize-winning French architect Jean Nouvel. Featuring a bold colour palette, subtle striping and strong architectural expression, the collection, conceived over two years, uses combinations of black, grey, red and blue to deliver six colour signatures. Visit the anticipated exhibit Armour mon Amour by Stockholm based design studio Färg & Blanche. The Teatro Arsenale in the 5VIE ART+DESIGN includes Bolon's experimental textiles along with furniture, sculptures and an interactive installation. This year’s theme for FuoriSalone is 'White Design' and speaks to the syntheses of thought as a point of arrival and a conscious choice. Bolon's friend, Cappellini will take over the historical Pinacoteca di Brera for an architectural exhibition, which will also curate the dialogue between six installations designed by Chipperfield, Patricia Urquiola, Zaha Hadid, Libeskind, Mateus and Boeri. Bolon flooring from the Artisan collection will line the square courtyard of the impressive cultural building and welcome visitors into the various exhibitions. 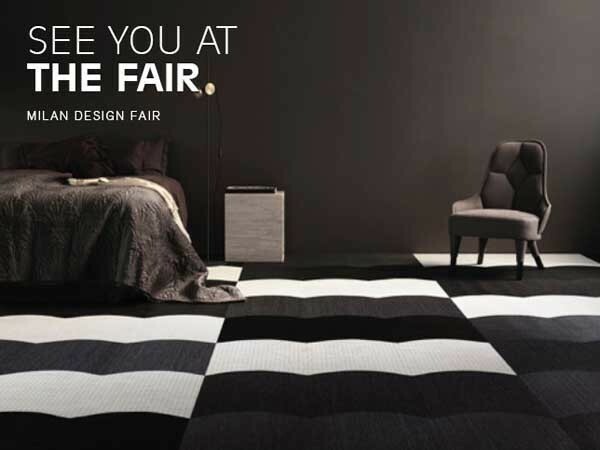 Bolon’s playful new Studio tile, Wave will feature alongside modular furniture by Montana in Hall 24:C05. Experience Bolon’s traditional and new experimental textiles in collaboration with BD Barcelona in Hall 16:B31. Bolon is represented in Australia by TAG - the andrews group.